Paprika Pork For Dinner! (serves 6) | Crappy Kitchen - Good Dinners! This was such a satisfying dish and the way it came about is how most things happen in this kitchen: rummaging in the pantry and picking out the most appealing spice of the moment and promptly building the entire dinner around that flavor. 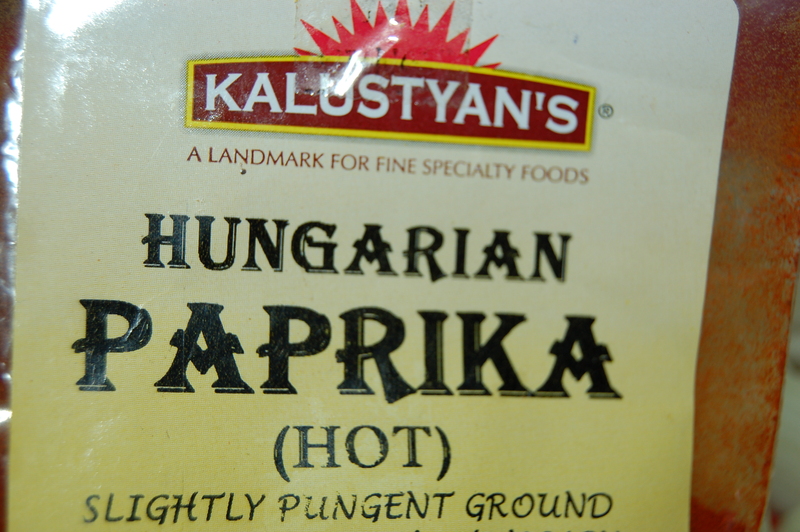 A couple of nights ago when going through my rummaging ritual looking for inspiration, I found a little bag of Hungarian Paprika from a trip I made to a marvellous spice shop in New York City, Kalustyan’s. 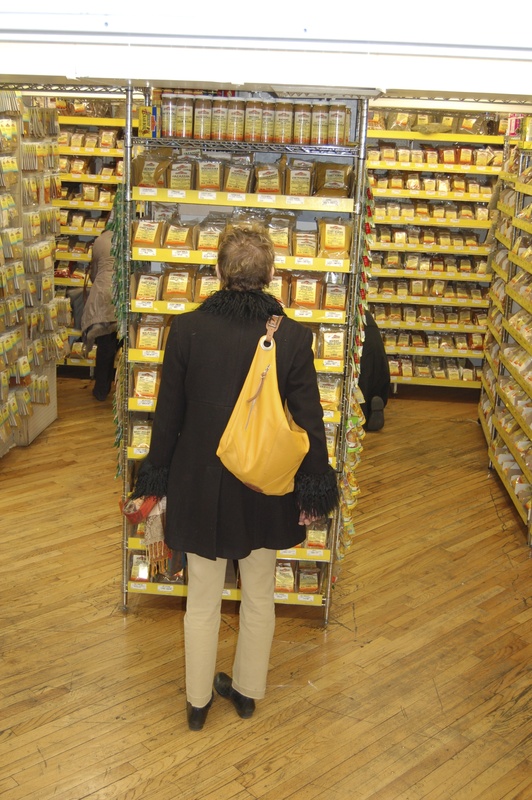 A customer mesmerized by a small section of the spice department at Kalustyan’s! The description read, “slightly pungent ground red pepper from Hungary with slightly hot aromatic rich pepper flavor” I knew that this would be all that was needed to dress up the pork tenderloin sitting in my fridge. Using pork tenderloin allowed me to cook a rich and heavenly dish in a very short amount of time. It was truly amazing and is another great dinner to turn to if in a hurry, or you are faced with the sometimes overwhelming task of feeding a crowd. This dish would make it a snap! 1 – Season tenderloin with sea-salt and black pepper. Place a saute pan on high heat and add the oil. When it is hot add the tenderloin and sear on all sides until browned (this seals in the flavor). Remove to a heavy casserole pot and set aside. 2 – Turn heat down to medium and add the onions and cook for a few minutes before adding the celery. Cook for about 5 minutes, stirring occasionally. Add the chopped marjoram and stir. 3 – Add the paprika and stir into the onion mixture. Add the salt and the flour and stir quickly. Let it cook for about 30 seconds or so. 4 – Add the broth 1 cup at a time while stirring. Turn the heat up to high and add the carrots. When it comes to a boil pour the whole thing over the casserole with the tenderloin. 5 – Cover and place in your preheated oven for 45 minutes. 6 – Remove from oven and transfer the tenderloin to a cutting board and cover loosely with foil. Let it rest for 5 minutes. In the meantime add the spinach to the casserole and cover with lid. (it will wilt into the sauce). At this point you can taste the sauce for addition of seasonings. Adjust if necessary. 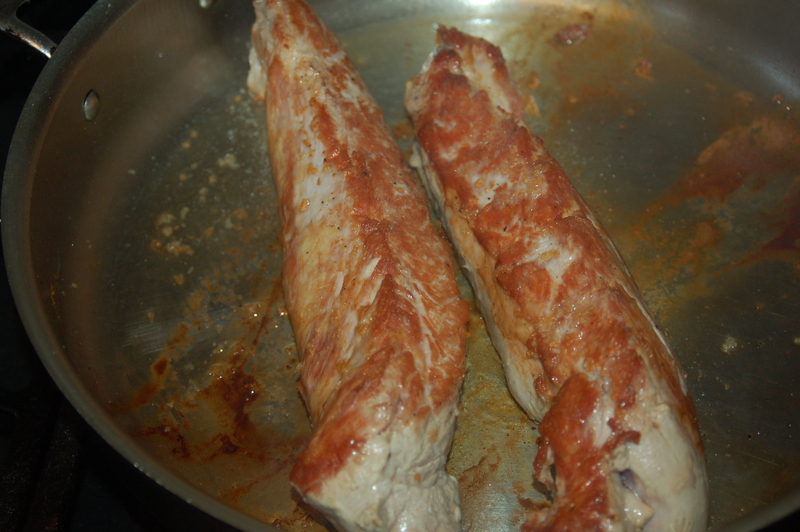 7 – After the meat has rested cut into thick slices and transfer back to the casserole. Serve with whatever you like: rice, boiled or mashed potatoes, pasta or bread. This is also great served with a dollop of sour cream and a sprinkle of cayenne pepper flakes. This entry was posted in dinners and tagged casserole, easy dinner, hot paprika, hungarian dish, hungarian-style stew, Kalustyan's, paprika, pork casserole, pork tenderloin, stew. Bookmark the permalink.